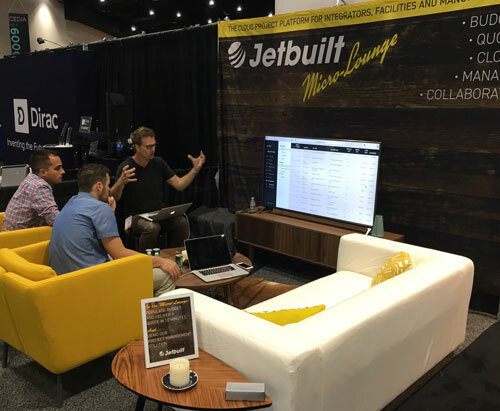 We took the Jetbuilt Micro Lounge to CEDIA in San Diego where folks could experience the connection between quoting and task management. The response was even more enthusiastic than we expected. We'll shoot out an email later this week with a video tutorial on Task Management. You will be able to invite your Field Techs and PMs into your account at no charge while you evaluate the system and see if it is the right fit for your installation workflow. Once again, the Jetbuilt Micro Lounge proved to be a welcome oasis to weary CEDIA travelers. Apparently Paul is talking about the fish he caught before the show. Thanks again for using Jetbuilt and for all the great comments. Older PostNew Features, CEDIA Lounge, PM Preview!